The Late Quaternary sediments of the Forth of the Firth represent the paraglacial environment that followed the Last Glacial Maximum (LGM). The various marine and deltaic/beach deposits are used as marine markers to help understand relative sea level and the depositional setting of the Firth of the Forth during this time. The oldest post-glacial depositional setting is represented by the Late Devensian-aged marine deposits. Figure 28 (a) shows a surface that extends across the Firth of the Forth area that is at the maximum height of the mapped Late Devensian marine deposits. Significantly this helps illustrate the extent of the post-LGM marine incursion event. Borehole records from the upper reaches of the system (in land of Stirling) describe deltaic deposits along the edges of the marine limit. Equivalent aged river or estuarine deposits are not described elsewhere in the estuary. However, it is also possible that the estuarine deposits described in the upper parts of the Firth the Forth are not contemporaneous with the post-glacial raised marine deposits but represents a later stage depositional setting, i.e. were deposited during gradual sea-level retreat during the Holocene. The majority of the raised marine deposits are similar to the Errol Clay Formation sediments described near Perth that are interpreted as a shallow sub-tidal marine environment (Peacock, 2003). Hence, the marine limit that is interpreted from these deposits is a minimum limit, as sea-level represented by these sediments is likely to have been slightly higher. Significantly, the raised marine deposits in all cases sit directly on till suggesting no intermediate depositional environment prior to the marine incursion. Hence, suggesting a rapid sea-level incursion after the LGM deglaciation resulting in the deposition of sub-tidal marine deposits prior to the deposition of any glacial outwash deposits in the area. In essence it appears that ice was replaced by sea, so that as such the deposition of the Devensian raised marine deposit did not require a sea-level rise as such. Figure 28 A model for relative sea-level in the Firth of the Forth shown as surfaces in GeoVisionary including, (a) a surface at the top of the mapped Devensian-aged raised marine deposits; (b) a surface at the base of the Devensian-aged deltaic deposits mapped between Grangemouth and Stirling; (c) a surface at the top of the mapped Holocene marine deposits (Smith, et al., 2010); and (d) the current Firth of the Forth sea level. Overlying, the raised marine deposits in the central part of the Firth of the Forth is a proglacial deltaic deposits, the base of which can be used as a second sea-level marker (Figure 28 (b)). A sea-level surface based on these deposits illustrates sea-level during the ongoing falling relative sea-level in the Firth of the Forth. Unlike the older raised marine deposits the mapped post- glacial beach sediments represent a relative sea-level minimum. A major embayment developed along the southern margin of the central part of the Firth of the Forth, where underlying top till and rock head topography is not as steep as in other areas in the system. After the post-LGM sea-level high stand there was a gradual fall in relative sea-level, as isostatic rebound outpaced eustatic sea-level rise (Shennan, et al., 2006). The rate of relative sea-level fall was initially relatively fast after the LGM deglaciation but slowed after the Loch Lomond glaciation (Boulton, Peacock, & Sutherland, 1991; Shennan, et al., 2006; Smith, et al., 2010). The relatively high post-glacial sea-level resulted in predominantly thick clay and silt deposited in the Firth of the Forth. The thick fine-grained sediment sequence suggests a relatively low energy environment, such a distal offshore estuarine setting or a subtidal marine environment. This relatively high sea-level in the central and outer parts of the Firth of the Forth resulted in the infilling of the available remaining accommodation space. Around the Grangemouth and Ochil Hills areas there are thick deposits of silt and clay overlying till. The clay and silt deposits are also still moderately thick near the mouth of the estuary. The thinnest clay and silt infill is observed inland of the Stirling where the sea-level incursion was short lived. Previous work looked in detail at borehole records from upper 15 m of intertidal sediment near Grangemouth, which is described as the Holocene Claret Formation (Barras & Paul, 1999). The work interprets the sediment as representing a sub-tidal to inter-tidal environment and representing a gradual fall in relative sea-level during this time. The sediment underlying the silts and clays of the Claret Formation have been described as equivalent of the Linwood Clay Member of the Clyde Clay Formation representing the Windermere Interstadial. The full thickness of each formation and therefore the boundary of the two formations in the borehole records is currently unknown. The borehole records studied as part of this work show little change in the type of sediment across the Windermere interstadial and Holocene suggesting a similar sub-tidal environment also during the Windermere Interstadial. Studied borehole records from the Western Forth Valley of Windermere Interstadial sediments also describes a shallow fjord-style margin environment (Holloway, L, Peacock, & Wood, 2002). The Younger Dryas (Loch Lomond Stadial) is likely to have resulted in a short-lived fall in sea-level followed by a relatively quick recovery (Shennan, et al., 2006). It is unclear if this is represented in the sedimentary record as this may have locally changed the nature of the infill of the main estuary for short time period. There is no evidence for a major change in sedimentation across the estuary on larger scale in the borehole records. Ice raft deposits are interpreted locally around the Grangemouth area from borehole records (Peacock, 1998), however such deposits cannot be seen on the larger scale. A sea-level transgression has seen described by numerous workers for the early Holocene in this area, dated at c.7800 BP in the inner Forth area (Sissons & Smith, 1965; Cullingford, 1991; Smith, et al., 2010). The deposits associated with this sea-level transgression are also observed elsewhere along the southern Scottish coastlines, such as near Girvan (Jardine, 1975). 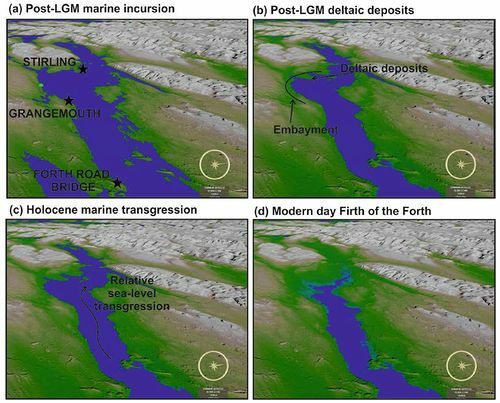 The early Holocene sea-level transgression resulted in the flooding of the entire Firth of the Forth, with marine deposits (Smith, et al., 2010) including in the uppermost parts of the Firth of the Forth. ↑ PEACOCK, J. 2003. Late Devensian marine deposits (Errol Clay Formation) at the Gallowflat Claypit, eastern Scotland: new evidence for the timing of ice recession in the Tay Estuary. Scottish Journal of Geology, Vol. 39, 1–10. ↑ 2.0 2.1 2.2 2.3 SMITH, D, DAVIES, M, BROOKS, C, MIGHALL, T, DAWSON, S, REA, B R, JORDAN, J, and HOLLOWAY, L. 2010. Holocene relative sea levels and related prehistoric activity in the Forth lowland, Scotland, United Kingdom. Quaternary Science Reviews, Vol. 29, 2382–2410. ↑ 3.0 3.1 3.2 SHENNAN, I, BRADLEY, S, MILNE, G, BROOKS, A, BASSETT, S, and HAMILTON, S. 2006. Relative sea‐level changes, glacial isostatic modelling and ice‐sheet reconstructions from the British Isles since the Last Glacial Maximum. Journal of Quaternary Science, Vol. 21, 585–599. ↑ BOULTON, G, PEACOCK, J,and SUTHERLAND, D. 1991. Quaternary. Geology of Scotland, Vol. 3, 503–543. ↑ BARRAS, B F, and PAUL, M A. 1999. Sedimentology and depositional history of the Claret Formation (‘carse clay’) at Bothkennar, near Grangemouth. Scottish Journal of Geology, Vol. 35, 131–143. ↑ HOLLOWAY, L, PEACOCK, J, SMITH, D, and WOOD, A. 2002. A Windermere Interstadial marine sequence: environmental and relative sea level interpretations for the western Forth valley, Scotland. Scottish Journal of Geology, Vol. 38, 41–54. ↑ SISSONS, J, and SMITH, D. 1965. VIII.—Raised Shorelines Associated with the Perth Readvance in the Forth Valley and their Relation to Glacial Isostasy. Earth and Environmental Science Transactions of the Royal Society of Edinburgh, Vol. 66, 143–168. ↑ CULLINGFORD, R A, SMITH, D E, and FIRTH, C R. 1991. The altitude and age of the main postglacial shoreline in Eastern Scotland. Quaternary International, Vol. 9, 39–52. ↑ JAKDINE, W G. 1975. Chronology of Holocene marine transgression and regression in south‐western Scotland. Boreas, Vol. 4, 173–196.